Mainstreaming System – …And the Truth Shall Set You Free. 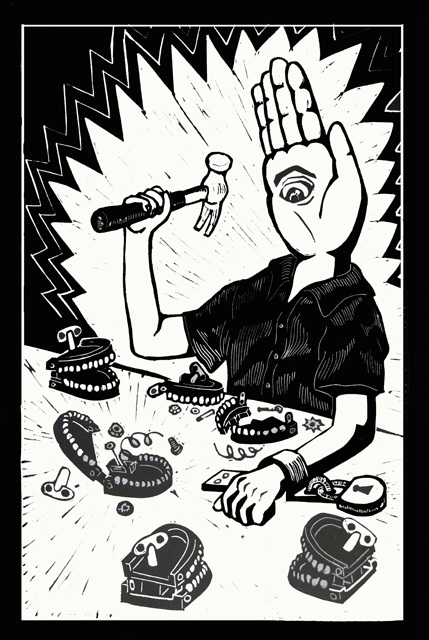 [The image above explains that David Call as a young child with “Eye Hand” head to symbolize my natural instinct to be a person of eyes and hands. One of my hands got strapped and locked on the table but I continue to resist oral speech lesson by using my free hand with a hammer to smash the wind-up oral chattering teeth toy. When my father was 15, he began to save up his money for his prize car, 1969 Chevy Chevelle SS 454 with 450 HP V-8–a model manufactured by Chevrolet for only 800 dollars. That car was undefeated beating every muscle car in the book. After my father got his license at age of 16, this car became his very first car ever. Easy to remember it! My father met my mother in high school, and after they set up their first date and he took her in this rare car. My mother was very lucky to ride in his baby! Three years later, they got married. My mom was only 18 when my father was 20 when I was born in the same year President Nixon had resigned. At age two, I was placed in the Tucker Maxon Oral School. The teachers, speech therapists, and audiologists loved to teach me face-to-face until I lost my dignity. The school was private and very expensive. My father had to give up his most prized car due to excessive costs of gas—45 miles each was to and from the school. My mother would have to drive me to that school five days a week, and you could easily imagine how expensive the gas it could be! My parents made a wrenching decision to sell the car and bought a 1975 baby blue Volkswagen bug due to cheaper gas price and for safety reasons, too. My father literally cried about his prize car for years. At age of four years old, my mother and father had to make a decision to place me into mainstreaming schools, which made it even worse for me. Although It was never my parents’ fault, it was the society that failed to facilitate them. I survived the hearing-oriented teachers. There were many subjects I wanted to learn but they were never considered important. Oral method of education was always important and it neglected me completely, without love. I felt like a piglet being left out in the mud. The chief educational goals were to make sure I had mastered speech—listening and speaking. What was more was that the school itself gave me permanent scars with emotional, physical, and intellectual injuries, all at once to make sure I forget my own identity as Deaf being. Tucker Maxon Oral School is being watched by Alexander Graham Bell Association (AGB). The school philosophy used “up twinkles” wiggling their fingers in the air that it was in favor of banishing sign language. One hundred and thirty-three (133) years ago on September 11th, the Congress of Milan changed everything forever that made Deaf people look like puppets. The Congress of Milan also known as Milan Resolution, I believe violates Deaf people’s intellectual lives. Let me begin my story: I was born into hearing family where 95% in that small town where loggers were. The name of the town, Yacolt, where I grew up means the valley of the demons or the haunted place because it was named for a Native American about three children were on their path to pick out blackberries but they were never seen again. It was believed that evil spirits had taken them. The same town I lived was full of bias where my childhood life racked up with emotional abandonment and was filled with fear growing up and hating myself due to the fact I am Deaf. The small town that time was only 500 people which is not known very well for its audistic (Audism-alike) tolerance so infiltrated with those people I had to deal with that I did not realize that I looked down on others unlike me until I moved out and begun my Deafhood journey from there. I had been confused all my life for next 35 years until couple of magic words showed up in my life that changed overnight that made myself a human being. The magic words were: DEAFHOOD and AUDISM. It shows exactly why the Alexander Graham Bell Association is a hate group and should be abolished. They had been gone virtual lynching, armed with myths they herald as gospel. People who works for AGB chapters are “bad-cats” believing what they want to believe in spite of the facts, so instead of listening to reason, they create an attack site and proclaim it as truth, with hearing-minded hillbillies adding to the mix. The AGB association is poison, those who support it are mentally unstable and in dire need of education. Enough said. We are living in year 2013. The stats shows that 80% of mainstreamed Deaf children in schools suffer high percentage that scored below the academic achievement than hearing students receive the royal treatment in classrooms. Deaf children will never taste the royal treatment in their lives. If you want the proof to see 80% of Deaf children fail their goals, you can find it in the National Center for Special Education Research. Harassment and bullying against Deaf children are invisibly reported and damaged as well. It is 2013! 2013! 2013! 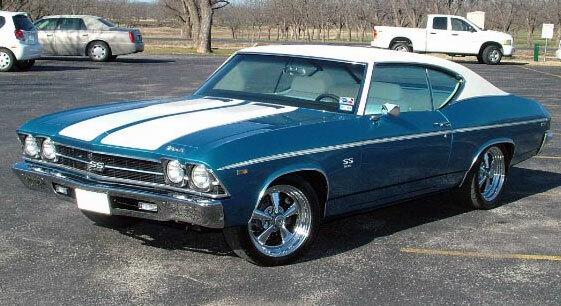 By the way, that prize car of my father, 1969 Chevy Chevelle SS, would be worth $100,000 at any auction bid today. My father bought that car for $800. Oralism took advantage all of his money. It is no wonder why my father is still crying for this baby.